"Car-crazy Los Angeles might have a few things to teach the smug Bay Area about mass transit," the Los Angeles Times headline read. Thank goodness. Don't let our smugness fool you. We mass-transit riders here in the SFGATE office are always grateful for a good transportation tip. For example, what should we do with our pants after riding on Muni, whose seats were recently found to be contaminated with a rare and possibly dangerous bacteria found elsewhere only in Southeast Asia and Korean wastewater? Burn them? Donate to Goodwill? Oh, and the BART escalators, three-quarters of which are 40 years old, keep breaking down. What do you recommend to keep people from peeing on them? Finally, can we interest you in some fake train-car cameras for your rapidly expanding Metro? We know where you can get a boatload of them really cheap. Apparently Los Angeles' main mass transit tip for the Bay Area is spend more money on mass transit. That's what the city's commuter-rail proponents hopes to do via ballot measure. If two-thirds of voters approve Measure M — authorizing an additional half-penny sales tax on every dollar spent — Los Angeles County would see a massive expansion of rail over the next 40 years. But as the Times notes, the Bay Area is already attempting to get voters to pay for transit improvements. The $3.5 billion bond measure, Measure RR, would rebuild BART core systems rather than expand routes in San Francisco, Alameda and Contra Costa counties. "We opened BART in 1972 and then proceeded to let it deteriorate and almost fall apart," San Francisco Supervisor Scott Wiener, chairman of county transportation authority, told the Times. "Meanwhile, over the last 35 to 40 years, we've grown by about 2 million people in the Bay Area, and ... we've fallen behind." Los Angeles has one big advantage over the Bay Area in improving transit. As the system is wholly contained in one county rather than several, it can plan and carry out its vision — and obtain funding — without having to build consensus from multiple counties. But the city is also much more spread out than San Francisco, and while Measure M would greatly expand its rail network, the trick is getting people to use it. After all, L.A.'s love for the personal automobile is almost a cliche. Still, as commute times grow — drivers waste an average 64 hours in traffic per year,the worst in the nation — a more accessible and extensive rail network might wean drivers off the freeways. San Francisco's gridlock is not much better than L.A.'s — the annual wasted driver time is 56 hours on average, the third worst in the nation. The economic boom in Silicon Valley has exacerbated the problem. Anyone who commutes along Highway 101 sandwiched between two tech buses can attest to the soul-crushing stop-and-go traffic that occurs even during off-peak hours. So yes, Los Angeles, the Bay Area surely needs to fix mass transpiration. But we still take pride in BART even though we know it's outdated, decrepit and desperately needs to be expanded. And we know Caltrain, Muni and other systems are also overdue for upgrades. 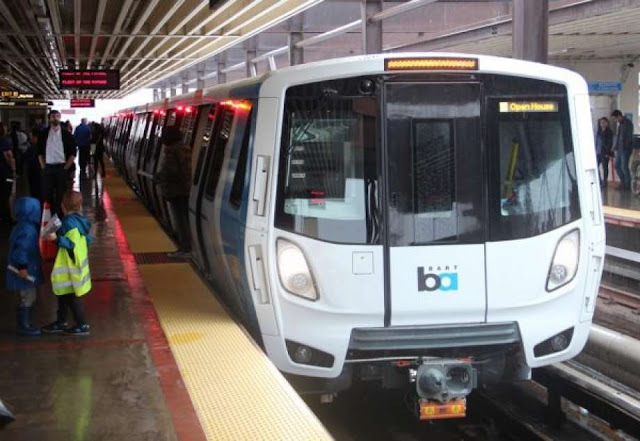 Measure RR, Santa Clara's Measure B (half-cent sales tax increase for transit and freeway improvements) and Propositions J and K in San Francisco, to fund infrastructure improvements to Muni — if they pass — would be a start. If they don't pass, we can look forward to something that's quintessentially L.A.
More gridlock on the highway.